Discover the basic strategy needed in order to succeed at Spin & Go's at PokerStars and how everyone can benefit from playing this format. 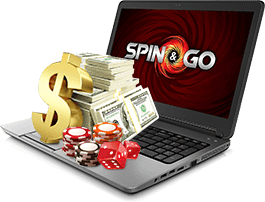 Ever since Spin & Go's were launched back in October 2014, more and more players have been drawn in by the appeal of winning a life changing amount of money. Granted, it's easier said than done to hit a huge jackpot, but with a developed strategy and some experience playing this specific format, you can make a nice profit regardless. Like every other form of poker, variance plays a huge part in the amount of money you win or the amount of money you lose. But, developing a strategy allows you to have as much control as possible due to the edge you have on your opponents. So, if Spin & Go's are something you're interested in, keep reading in order to gage a better understanding of how the games work and how you can beat them. Spin & Go's have essentially the same format as Sit & Go's, but are much more appealing to the masses due to the ever changing prize pool. The following factors should help you determine how the format of Spin & Go's work and what to expect from these games. A maximum of 3 players for every Spin & Go. Each player starts with 500 chips and blinds increase every 3 minutes. The prize pool is revealed before play begins by the buy-in multiplier and it's a winner takes all format. Also, no deals can be made between the players. Players finishing in 2nd and 3rd will only receive a payout if the Spin & Go is offering a huge jackpot (100x, 200x, 3000x or 10000x). Additionally, this payout is much smaller than what 1st place receives. The most common prize pool is 2 buy ins and you will see this payout more than any other. With all this in mind, it's important to understand that more often than not you'll only be playing for a prize pool of 2x your buy-in. As you can imagine, recreational players can start to develop the mindset that it's inevitable that they will hit the jackpot prize pool, but unfortunately it's very unlikely. There is no doubt that this format is incredibly fun to play and offers players something completely different in comparison to cash games and tournaments. But, staying realistic and controlling what you can is just as important, like every other format of poker. Although Spin & Go's are a relatively new format of poker, having some experience playing short handed cash games or short handed in the late stages of tournaments will put you in good stead for this specific format. Due to the 3 minute levels and players starting with only 25bb, having a concrete strategy will help you play optimally when a lot of your opponents will just be trying Spin & Go's out for the first time. By following some of the key points below, you should be able to develop an edge over your opponents despite the shallow stack you'll be starting with. A common mistake inexperienced players make in this format is waiting for a good hand and not taking the initiative in the first few levels. Remember, you only have 25bb and with the 3 minute blind levels, once you find a good hand you might only have a few big blinds remaining in your stack. Now, this doesn't mean you should be opening 100% of your range, but controlled aggression is definitely optimal, especially from the button and small blind. It's important that you try and find out as much information as possible during the early stages, such as: Are players not defending the blinds properly? Are all of your button raises getting through? Are your opponents playing passively and not playing back at you? Do your opponents seem like weaker opposition? Once you have a feel for your opponents, you'll be able to gauge how aggressive you can be and adjust your opening/shoving ranges around that. Due to the shallow stacks, calling an open raise becomes a lot less profitable in this format. You'll only be playing 25bb effective poker in the first level and even then, you should only really have a calling range from the big blind. The problem with calling raises out of the small-blind is that you'll be out of position every time and you'll struggle to realise the full equity of your hand when post-flop. Therefore, a lot more hands are added to your 3-bet jamming range, which is going to be so much more profitable than calling. A typical 3-bet jamming range from the small-blind can be the following. See table on the right "For 20bb effective". Admittedly, this specific range can be adjusted depending on the opponent opening from the button. If the player has been relatively tight, you can adjust the range accordingly and the same applies for players who are extremely aggressive. In addition, this range can also be applied to the big blind, but considering you have already invested 1bb into the pot, majority of the time you'll be getting the right price to just call with most of your range, even off a short stack. Preserving your stack at all times is something that will go a long way in Spin & Go's. So, whenever you're opening from the button, min-raising is ideal as you don't have anything invested in the pot so risking the least amount of your stack is going to be much more profitable. As for the small blind, considering you already have half of the big blind invested, you have more incentive to fight for the pot and try to take down the hand. Therefore, upping your sizing to around 2.5x is fine from this position as you're increasing fold equity and giving the BB less incentive to call. A common mistake people make from this position is min-raising, you give your opponent a great price to call and they then have an advantage playing in position. Also, the shorter you become, the more you'll start to open shove from the small blind and raise sizing won't be an issue. After the first few levels of a Spin & Go, more often than not you'll find yourself playing a push or fold strategy with <11bb. You'll no longer have the stack to play post-flop poker and 3-bet/folding becomes a less favourable option as well. So, if you're struggling to build a +EV jamming range from these positions, the following charts will give you an idea of what your range should look like. See table "11bb button range". As your stacks becomes shorter than 11bb, you can start to add a few more hands into your jamming range, but this is a good way to build your range and gain some experience by using a set strategy. See table "11bb small blind range". As you can see, your small blind jamming range becomes a lot wider as you only have to get one player to fold. Similar to the button, the shorter you are the wider you can open jam. Additionally, if the player in the big blind seems like an extremely tight player, you can widen your jamming range as they won't be calling with the correct range. Once you've started getting a feel for your opponents, you can adjust your ranges accordingly and start to build a strategy of your own. The introduction of Spin & Go's at PokerStars definitely caused a divide in the online poker world. Whether you're a professional or recreational poker player, you've almost certainly got an opinion about Spin & Go's and what they offer to the game. Understandably, not everyone agrees with this new format of poker. So, the following advantages and disadvantages will show you the ins and outs of Spin & Go's and why it's splitting the poker world straight down the middle. New players are constantly accessing online poker and by playing Spin & Go's and experiencing the thrill of online poker, eventually these players will filter through to other games. Affordable. This attracts a wider amount of players to Spin & Go's and ultimately gives recreational players a fun and cheap experience of poker that can motivate them to dedicate themselves to the game for a long period of time. Recreational players will lose at a much slower rate than they would playing roulette or blackjack. Also, with a much bigger element of control and skill in Spin & Go's, players can learn and have a much better chance at making money. Ultimately, online poker has the potential to grow by more and more players joining the poker tables from casino sites. Which can surely only be a good thing for online poker? Spin & Go's are possibly taking away the skill element of the game due to the quick format of the games and how little play there is during each game. The 'jackpot' element of Spin & Go's is the same hook that attracts gamblers to roulette and blackjack games, which disregards the amount of skill necessary to become a successful poker player. Due to the high amount of rake that is charged, recreational players will actually lose their money at a high rate and won't be able to sustain the combination of rake and variance at these games. Which effectively makes these games unbeatable for not only recreational players, but everyone.